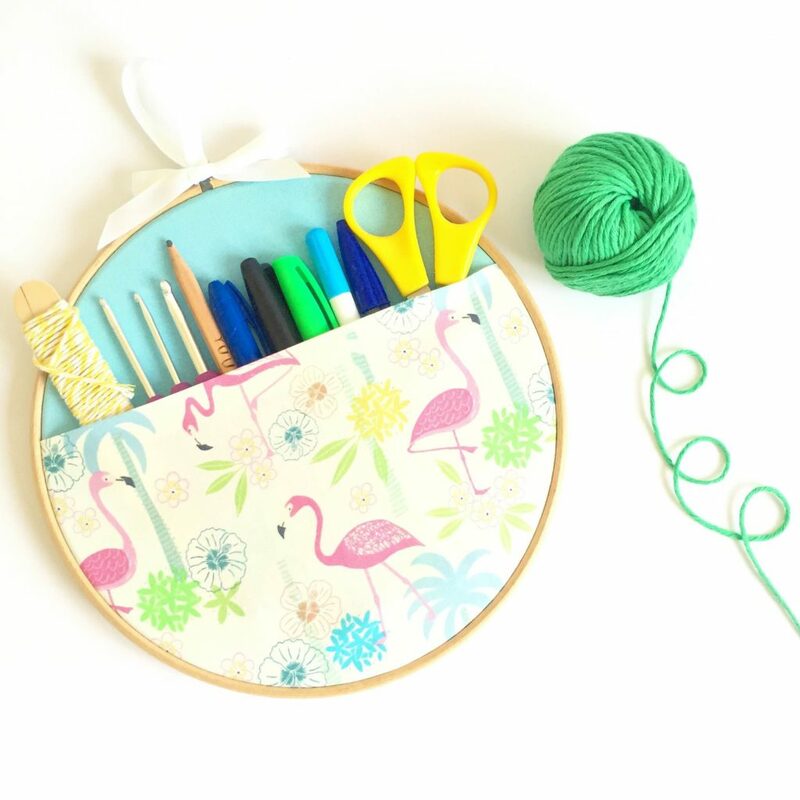 In this post, I show you how to make your very own scissor minder and you can also use this tutorial to make bigger craft supplies storage hoops. Anyone else have a serious scissor addiction? Mine is borderline at the minute but I probably have more than the average person and I was hitting the problem of running out of places to keep them. I usually have 1 pair for each project I’m working on but this still leaves a few that end up buried and lost in my messy desk; not just annoying but also slightly dangerous when you have little fingers exploring the house. I needed a storage solution that was high, but still easy for me to grab a pair as I needed them. I was inspired by an order I got for one of my pocket hoops. I don’t sell these anymore, but in 2016 they were one of my top sellers. 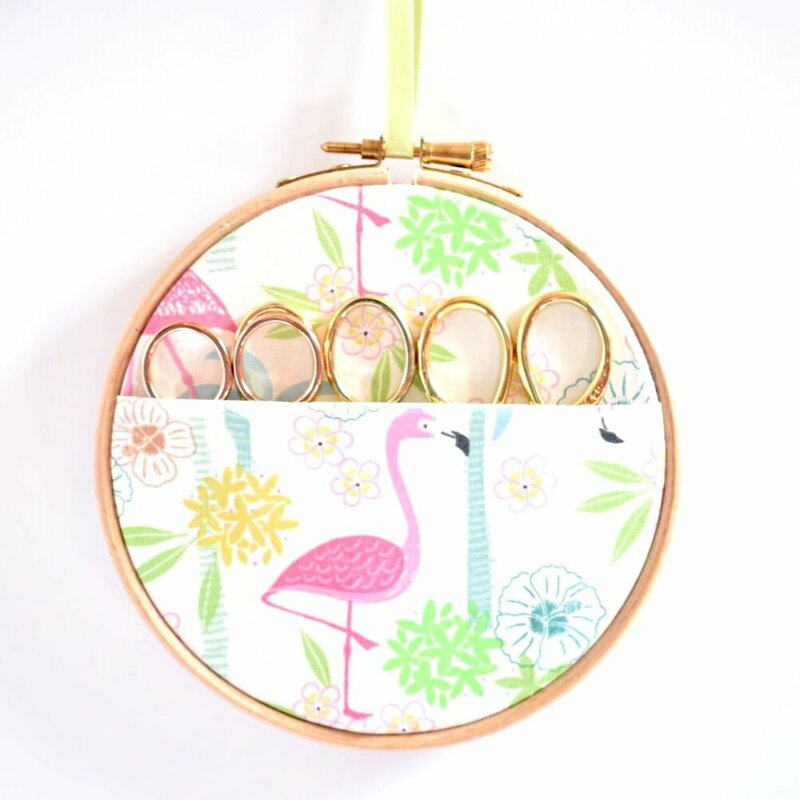 An 8 inch hoop that could hold pens, pencils, highlighters, sharpies and … scissors. However, 99% of my scissor collection are small, embroidery scissors and these 8 inch hoops were too big. The scissors would drop into the pocket and I would forget they were even in there. I needed a smaller hoop, specifically for my embroidery scissors. So as I don’t sell these anymore I thought I would pop up a tutorial for you to try at home. I used matching fabric for the backing and “pocket” but using a plain back and patterned front looks nice too, and is how I would always do my bigger ones. 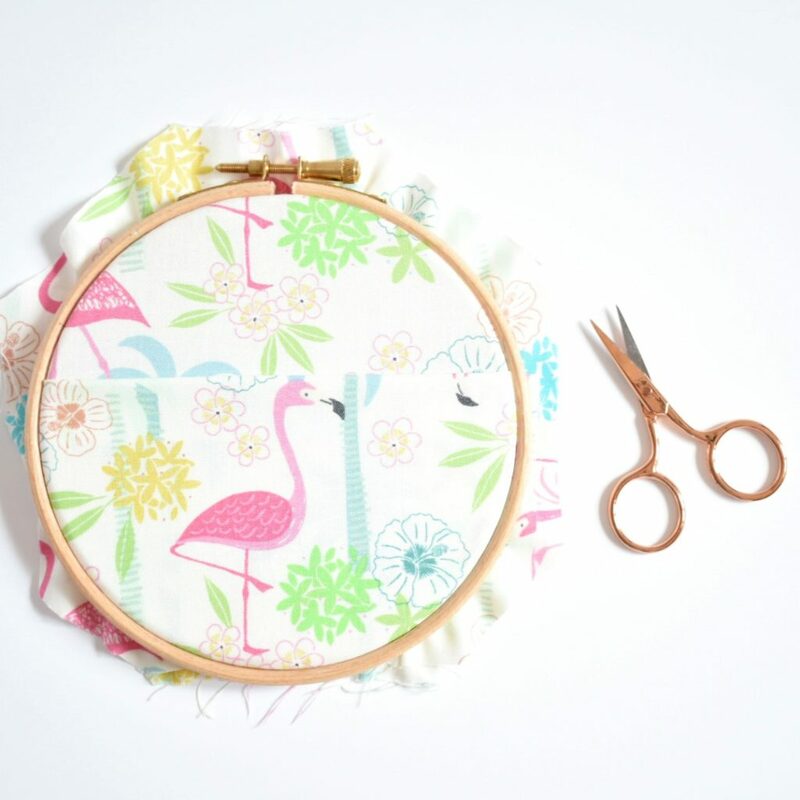 To start, take your inner hoop and place it on top of your felt. 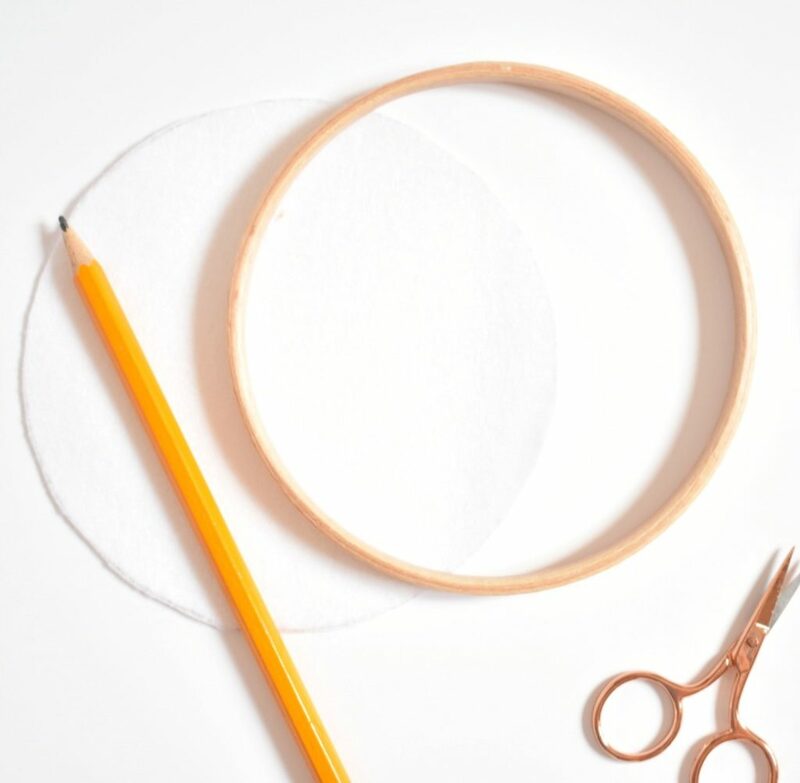 Draw around the outside of the hoop, cut it out and keep it to one side for later. 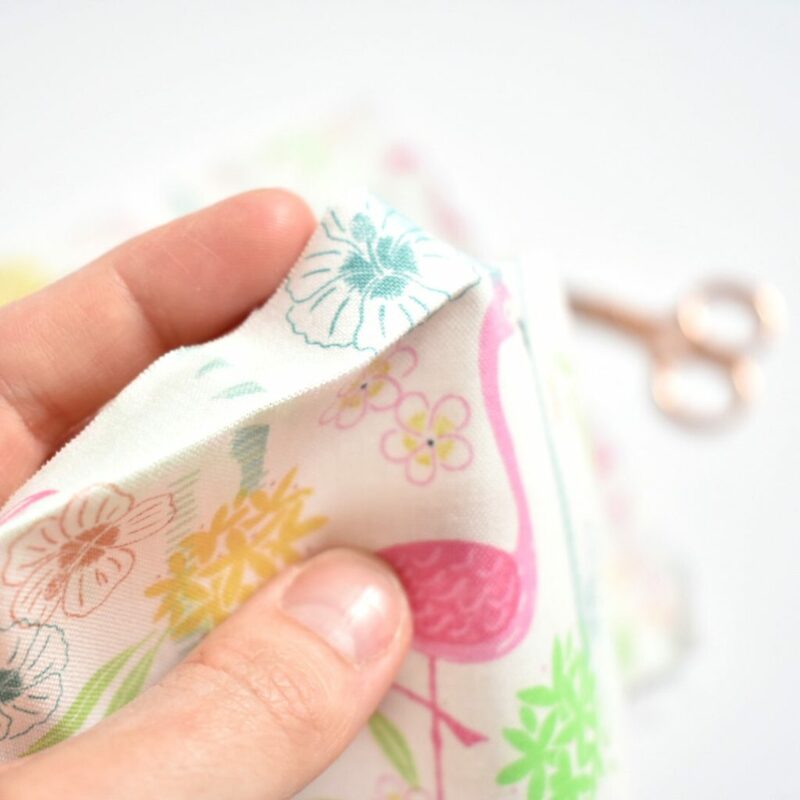 Next, take your smaller piece of fabric and make a small fold on the top, long edge. You can choose whether to iron this fold (I didn’t as it’s quite small). 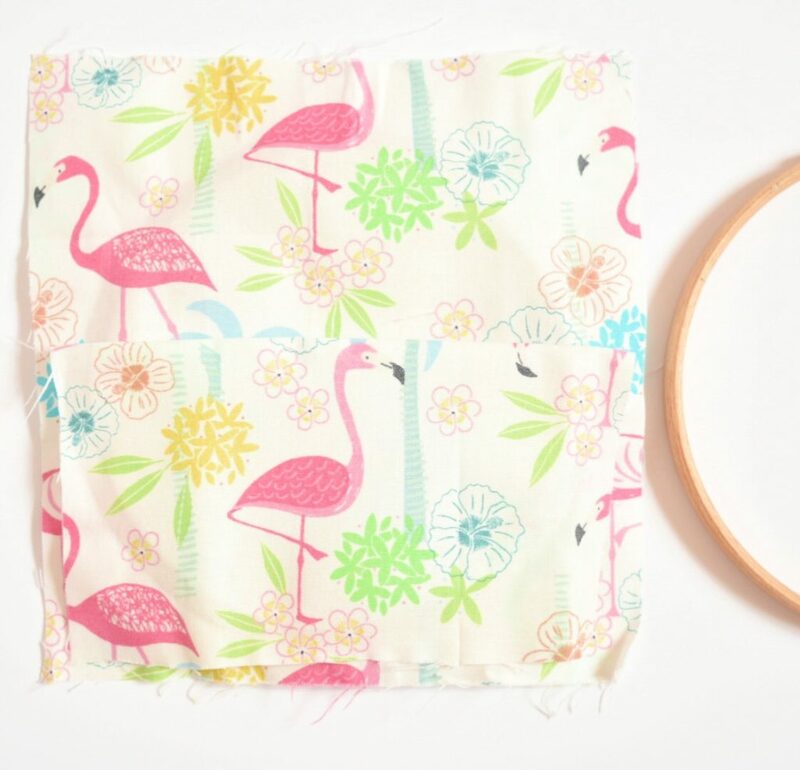 Then you can sew along this line to keep the fold down or use some interfacing. Again, I didn’t do this as this is a small holder, however I do sew along it for bigger holders/hoops. If you don’t have a sewing machine, a running stitch will work fine. Another option if you don’t want to sew the seam is to use a bigger piece of fabric and fold it in half so then there is no loose fabric at the back. 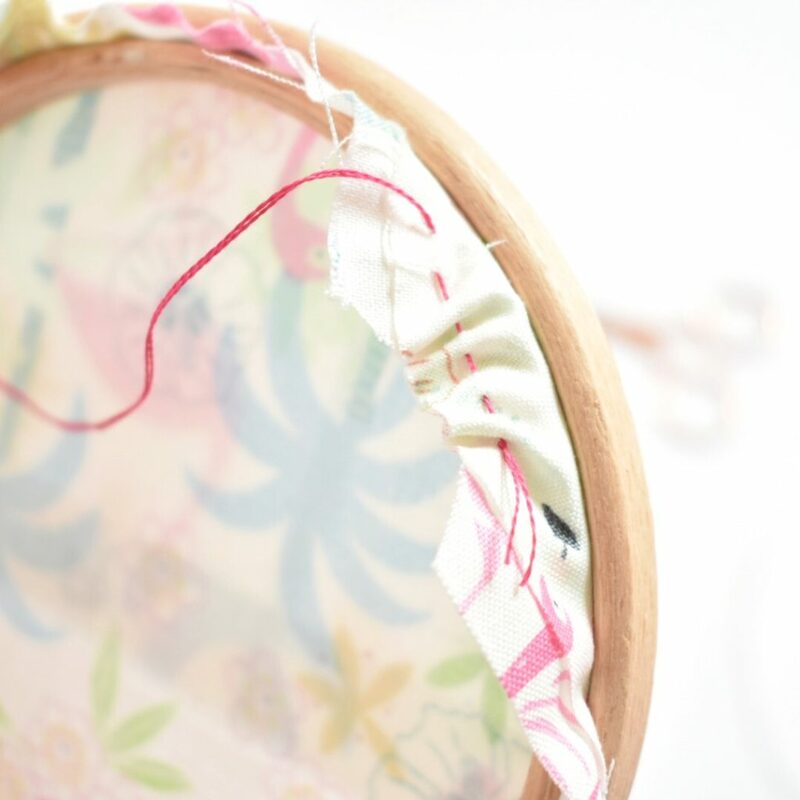 Now place your 2 pieces of fabric on top of the inner hoop. 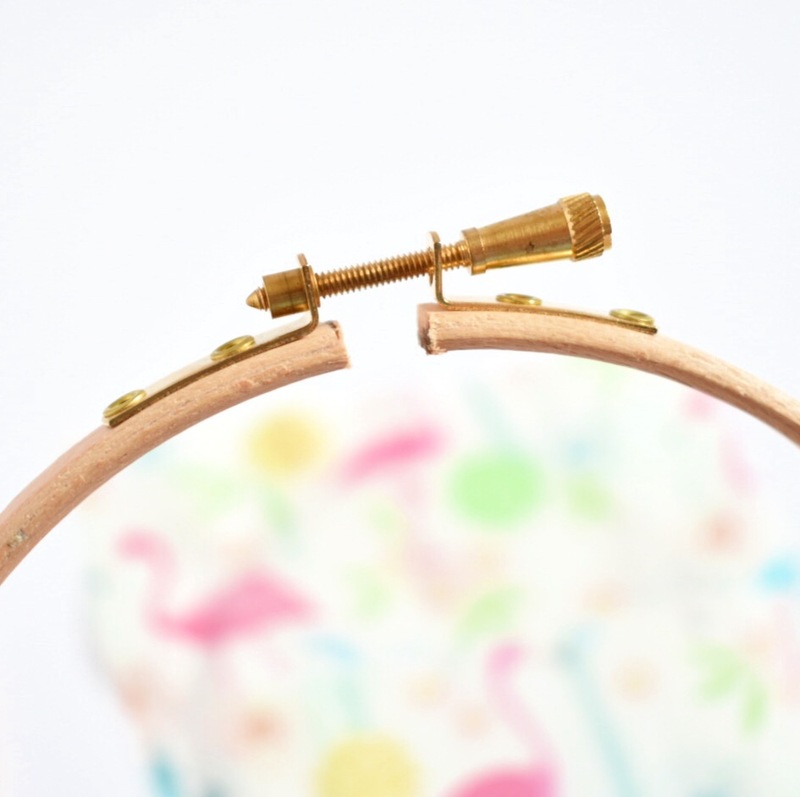 The smallest piece goes at the top, lined up at the bottom edge, so the fold is across the centre of the hoop. 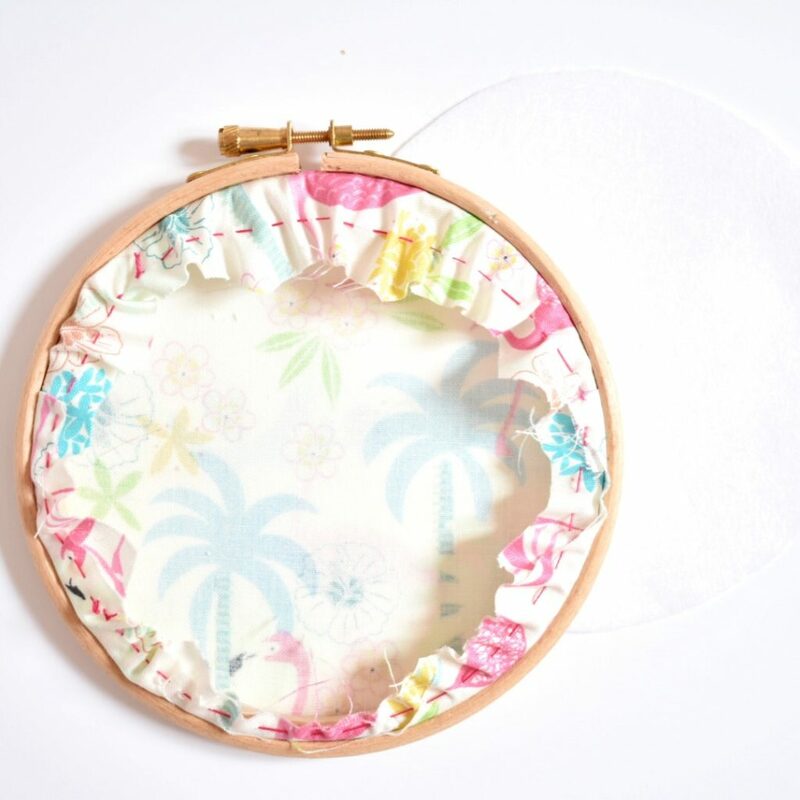 Open your outer hoop quite far and put it on the inner carefully, trying not to move your fabric out of place. Tighten the screw and as you do, keep pulling the fabric taught but keeping it lined up. I recommend a screwdriver to tighten it up more once you have finished by hand, especially if you are like me and have no upper body strength. Seriously, I have trouble opening bottles. Next, snip off the corners of the fabric. 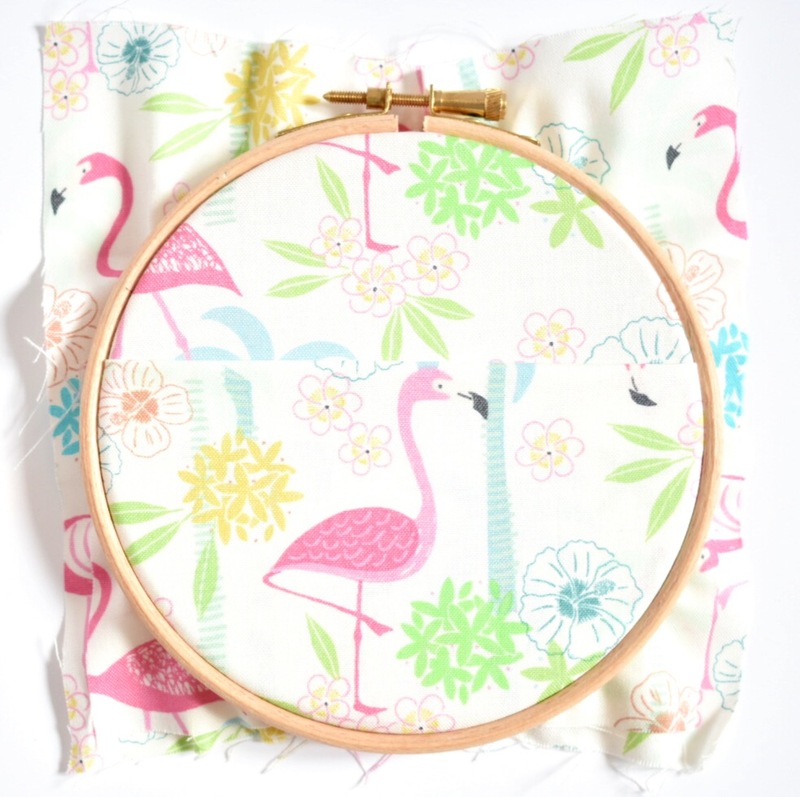 Then do a running stitch to bunch up this fabric and use a blanket stitch to stitch your piece of felt on the back. 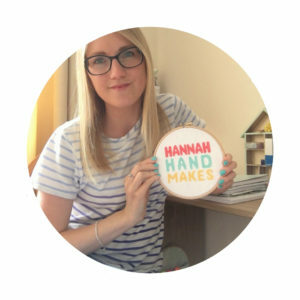 I won’t go through these stitches here as I already have a tutorial on how to back your hoop that you can pop over to if you need. I recommend stitching the felt on the back instead of leaving it without as some people do with embroidery/cross stitch work. 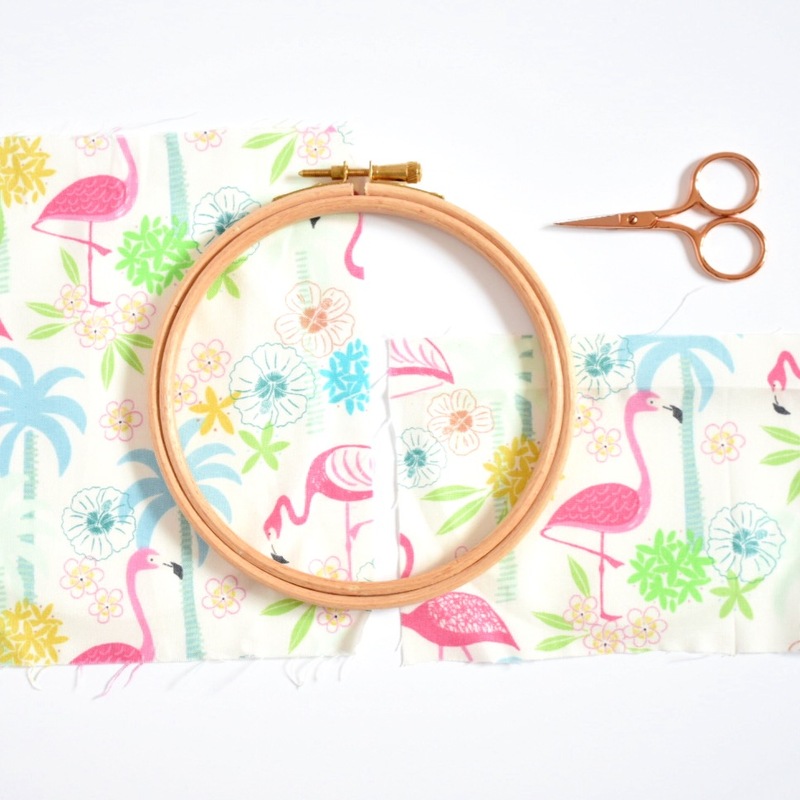 The felt helps keep the fabric in place when you are putting the scissors in, as the scissors are heavy and can make the fabric a bit loose over time. The felt helps prevent this. Glueing the fabric down with a glue gun is OK too if you prefer this method for backing. Tah-dah! You can do all sorts of sizes for these and have fun finding fabric combinations to match your decor. 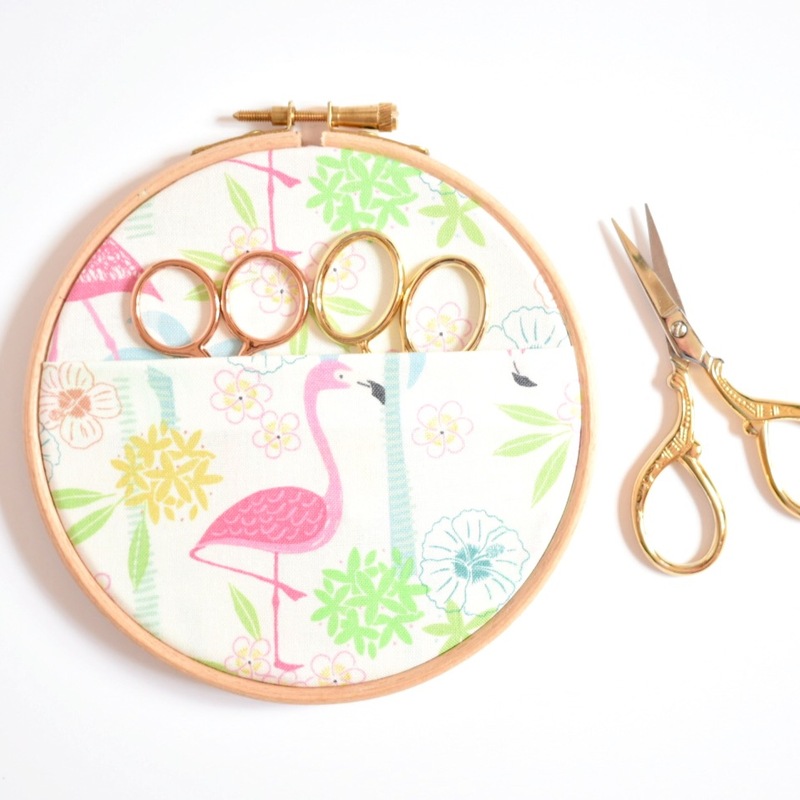 Need some scissors to add to your collection? I sell the rose gold ones used in these photos and some mermaid, stork ones too! And don’t forget to join my Facebook group and share your progress with the other makers in there. I love seeing WIP photos!